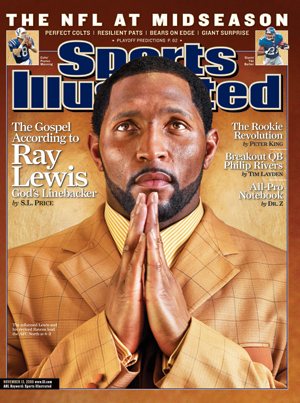 Ray Lewis has a story to tell, of persecution and redemption, of fathers and sons, of pain caused and pain endured. The trials he's suffered—and Lord knows there have been many—are all part of a master plan. This week on SI.com, we made our picks for the best players by uniform number (see 00-49 here, and 50-99 is here), and No. 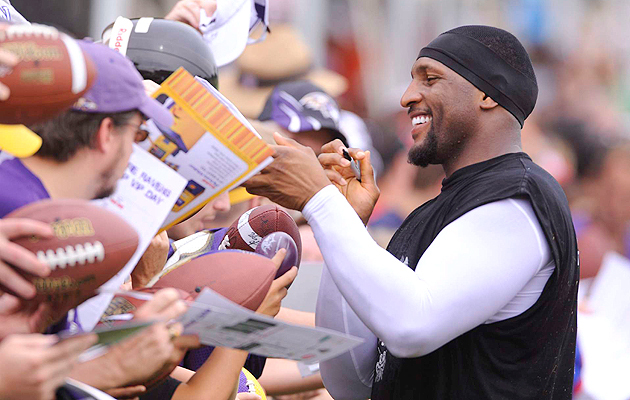 52 is none other than linebacker Ray Lewis, who played all 17 seasons of his NFL career for the Baltimore Ravens. The 13-time Pro Bowler had a storied career; he was the centerpiece of some of the best defenses in NFL history, and among his many accolades, he won two Defensive Player of the Year awards and two Super Bowl rings. But no matter how incredible his accomplishments on the field were, Lewis will always be followed by his arrest for murder in 2000 (charges were dropped). Lewis opened up to S.L. Price about his Christian faith in this story, which originally appeared in the November 13, 2006 issue of Sports Illustrated. To subscribe to the magazine go here, and you can buy a framed copy of the cover here. ​The sinner is breaking a sweat now. He's been telling his story for just over a minute, just enough time to start feeling it all again, and the reliving always brings rage. Called him liar, monster, abuser of women? Yes, the world did that. Called him killer? Yes, the world did, and does it still: He saw the poster in Cleveland in September, back of the end zone, with the drawing of a knife and the words asking how Ray Lewis can still be free. But here? Tonight? No. Or as he sometimes lets slip, “Hell, naw!” He's got his people, a bobbing, loving, understanding sea of 2,000 black faces before him. He's got his pastor, Jamal-Harrison Bryant, standing behind him, saying, “Talk, Ray, talk.” Tonight, indeed, Lewis has the Holy Spirit settling on him like never before. He grips the microphone in both hands, crouches ever so slightly, as if girding himself for the collision to come. A noise—“whooooaaa!”—rises out of the rows at the Empowerment Temple in northwest Baltimore, like the roar of an ocean wave gathering itself to crest. Applause, shouting, the wave full-faced and beginning to crash. Oh, he's got 'em now. Not that they didn't come here on this Tuesday night in late September—some dressed in Sunday-best suits and dresses, some in Sunday-best R. Lewis Ravens jerseys—primed to adore him anyway. 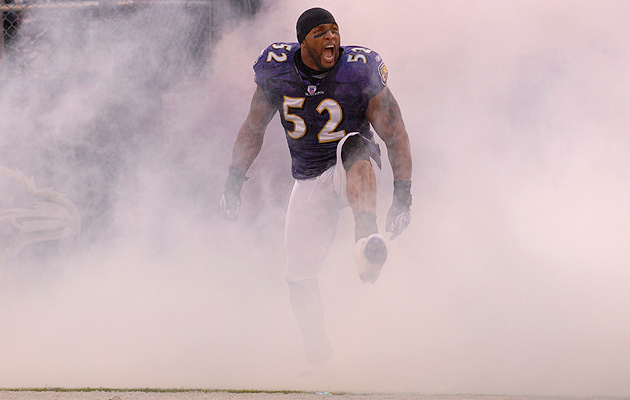 After all, Lewis was the molten core of the defense that anchored Baltimore's Super Bowl XXXV championship in January 2001, and this season, with him recovered from hamstring surgery and recharged by the addition of quarterback Steve McNair, the 6–2 Ravens are again a threat to win the AFC. Still, he's not here to talk football. They're not here to hear it. Tonight is about redemption. Tonight is about loving the sinner and hating the sin. 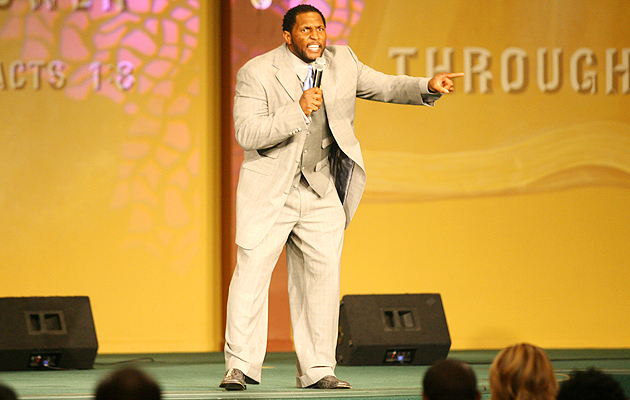 Tonight is about Ray Lewis, once accused of double homicide, the father of six kids by four women, living the word and spreading it through TV cameras dollying around the stage. He goes on to say how men have to treat their women like “queens,” sweet music to the ladies whooping at his words. But the 31-year-old Lewis, stalking about in an ash-gray three-piece and a thick-knot tie the color of clear sky, is going after bigger game tonight. For when you ask him, and often when you don't, Lewis will tell you these days that he's “​anointed,” that he enjoys “favor,” that he is a “king” charged with fostering a national ministry on the order of Martin Luther King Jr. and that, once football is done, his mix of piety and street cred and that spectacularly nasty, Court TV—chronicled fall will drag even the most hardened hearts to the light. Indeed, Lewis's revamped faith, like the man himself, is a raw, loud, electric thing, a muscular mix of the sacred and the profane. Every game day, just before another 60 minutes' worth of NFL hype and violence, Lewis will dip his fingers in consecrated oil, seek out a half dozen of his fellow defenders and trace a cross on each of their foreheads. A few other things Ray will tell you are that off the field he's not a vicious man and never hurt anyone, much less the two men who were stabbed to death outside Atlanta's Cobalt Lounge on Jan. 31, 2000; that he regrets the mistakes he made that night; that the resulting trial was a blessing because it made him change. It's a compelling narrative, and Lewis tries hard to make it stick. “Life is so great,” he will often begin a thought. When Lewis saw that poster at Cleveland Browns Stadium he strode along the sideline reciting the Lord's Prayer. Lewis says he's all about love, but when he talks about the Fulton County prosecutor, the former Atlanta mayor, the people who tried to send him to jail? Then he goes all Old Testament, his love full of loud and righteous fury. Now they're all in it together. Lewis starts bellowing, the crowd loses all control, clapping, stomping. He's going for a big finish: voice cracking, face wet, the words coming fast. Ray Lewis is feeling so justified that he's like a runaway train. And for all his spiritual growth these past few years, for all he will tell you about his new walk, it's clear now that Lewis retains every bit of swagger, menace, that palpable promise of violence that made him one of football's greatest defensive players. He's not about to let this testimony end in a haze of peace or love. No, this is payback, a bit of that Miami Hurricanes in-your-face, a holy f--- you to the world that tried to shut him away. And it's over. Bryant steps toward him, reaches for the microphone, but Lewis is too far gone. He flings the mike down, and it hits the stage with a reverberating thunk. God's linebacker stalks away, certain he's feeling nothing but grace. You could say he's paranoid, except that after District Attorney Paul Howard dropped the murder charges against him for the deaths of two men from Akron, Jacinth Baker and Richard Lollar, Lewis testified against the remaining defendants, his former friends Reginald Oakley and Joseph Sweeting. Both men were acquitted in June 2000, and that fall Sweeting released a rap song lambasting Lewis as a snitch, reportedly with such lyrics as Oakley should have stabbed ya, and If I knew what I know now, it'd have been three bodies. In February 2005 the FBI investigated death threats e-mailed to Lewis's charitable foundation. But he moves on because, well, what choice is there? One by one, a dozen teammates stop to assure Lewis they'll be at his barbecue restaurant for the weekly get-together later that night—one more sign that Lewis, the face of the franchise, is back as its heart too. Last year, sidelined for the final 10 games with the torn hamstring and unhappy with Ravens management, he had been a distracting, isolated figure, his misery confirmed when he publicly ripped the team's defensive schemes before the April draft. Taken together it felt like the beginning of a bad-taste end to Lewis's Baltimore career; the team even briefly scrapped their game-day player introductions, always capped by Lewis's signature gyrations. Such a one-year turnaround was small change for Lewis, a lock Hall of Famer who has spent six years disproving F. Scott Fitzgerald's lament that there are no second acts in American lives. Fitzgerald, of course, wrote in a time before talk-show mea culpas and high-speed news cycles made almost anyone famous and any deed forgivable. But even by today's standards, the second act of Lewis's public life has been a marvel of image rehabilitation. Murder suspect one night after the Super Bowl in 2000 and Most Valuable Player of the Super Bowl the following year, he once seemed the embodiment of the Entitled Athlete, the culmination of a thuggish era that featured O.J. Simpson, Latrell Sprewell and Rae Carruth. When the Ravens won it all, Lewis got no trip to Disneyland, no spot on the Wheaties box, but he was still the best player in the NFL—and for the image-obsessed league, a dancing, jawing, unrepentant nightmare. Yet since then, Lewis's charity efforts—his annual donation of Thanksgiving meals to 400 Baltimore families, his purchase of Christmas gifts for 100 needy kids, his providing of school supplies to 1,200 city students—have helped make him Baltimore's most-beloved public figure. Lewis's replica jerseys fill the 70,000-seat stadium; his face is indeed plastered all over the city, as once-wary corporations such as EA Sports and Reebok and KBank use his name to sell product. Even the league that fined him $250,000 for his role in the Atlanta incident surrendered; in recent years he has appeared in ads for NFL Equipment and worked as an NFL Network analyst. The cynical will say Lewis bought his way back into favor, but it's not as easy as it sounds: Neither O.J. nor former Green Bay Packers tight end Mark Chmura nor any other recently scandalized athlete has come close to Lewis's recovery. Yet it's that passion—the obvious relish Lewis takes in football's brutal essence—that makes it easy for those who only see him on TV to believe him guilty of murder. Early in the morning of Jan. 31, 2000, Lewis and a group of acquaintances, including Oakley and Sweeting, exchanged words outside the Cobalt Lounge with another group that included Baker and Lollar. Within minutes Baker and Lollar had been stabbed to death. Lewis's panicked group piled into his stretch limousine and sped off, gunfire blowing out one of the tires. Lewis told everyone in the car to shut up about what they'd seen, and during his initial interviews with police he gave false information. The limo driver at first told police he saw Lewis strike one of the victims, then recanted. Lewis maintains that he saw no one being stabbed and had acted only as a peacemaker. Sunseria Smith was in Hawaii, on the phone with her son, when the police came to the house where Lewis was staying. She heard her son yell, “What are you doing?” and then, “Mama, I didn't do nothing!” before the phone dropped. When she visited Lewis at the Fulton County detention center for the first time she put her hand on the glass separating them and said, "Is there any blood on your hands?" Lewis told her he had nothing to do with the crimes. “And I said, ‘That's all I need to know,’” Smith says. The prosecution's case against Lewis fell apart quickly, and the murder charges were dropped. Lewis pleaded guilty to one count of misdemeanor obstruction of justice, was sentenced to a year's probation and testified in the case against Oakley and Sweeting. As he walked down the courthouse steps in June 2000, Ray turned to Sunseria and said, “Mama, you have a changed man.” In '04 Lewis settled civil suits with members of both victims' families for roughly $2 million. He addressed the families during mediation for the settlement, at once expressing sorrow and raging over his certainty that he'd been prosecuted solely because he was rich. Still, some family members will never be soothed by the settlement or Lewis's perceived transformation. “I hope he can actively feel what it means to have a loved one taken away, the way my nephew was,” says Lollar's aunt, Thomasaina Threatt. On the football field, Lewis was undersized and unstoppable. He had 17 tackles in his first start at Miami and declared his intention to be the greatest Hurricane ever. Off the field, he seemed incapable of creating anything less than a Category 5 impact. He met McCall when she was a freshman at Miami in the fall of 1994. While she was carrying their first son, Ray III, the two got into a shouting match that prompted Lewis's first run-in with the law; a resident assistant said she saw Lewis push McCall, strike her in the face and put his hands on her neck. McCall didn't press charges. If anything, she says now, she was the aggressive one in the incident. A year later Lewis stepped into an argument between McCall and Kimberlie Arnold, a former girlfriend of Lewis's. Arnold told campus police that Lewis shook her shoulder and scratched her, but again no charges were brought; in 2000 she told The (Baltimore) Sun that "he's not a violent or abusive person, not to me he wasn't." Yet violence has shadowed Lewis at nearly every step in his life. While he was away at college, a dozen close friends and relatives from Lakeland died, one trying to rob a bank. Each time Lewis went home it seemed he was attending a funeral. Then in April 1996, UM linebacker Marlin Barnes and a female friend were bludgeoned to death by the woman's ex-boyfriend in the apartment Lewis and Barnes shared; Barnes was buried the day Baltimore drafted Lewis. More than a decade later Lewis still cries at the mention of his friend's name. Barnes wasn't just the one workout partner who could keep up with Lewis; he also pushed him, told him he was unique, even predicted his trouble. "Man," Lewis remembers Barnes telling him, "everybody ain't going to like you." Barnes filled the void left by Lewis's father; he organized his clothes with care, so Lewis did, too. He shaved off his body hair, convinced that it would give him that extra 10th of a second, so Lewis did, too. When Barnes died, Lewis felt he'd been thrown back out on that stoop, waiting for a face that would never come. He punched a hole in a wall and thought, Now you're gone too? After signing with the Ravens, Lewis tried to reconnect with his father, gave him $5,000. "He burned me," Lewis says. "Blew the money, left my life again." Every once in a while Jackson would surface, and everyone would remark on how alike the two men looked. Lewis thought he could understand himself if he could understand the dead ringer in the room. But over and over he would end up saying, "Dad? Can you just come around and don't ask for nothing? Teach me something." In 1997 Lewis and McCall went to court to establish child-support arrangements. By then she was expecting her second child by Lewis; the court mandated payments of $3,800 a month. The following year he was ordered to pay $2,700 a month, plus back payments of $29,700, to a Baltimore-area woman with whom he had daughter. The process left him drained, and he told his mother that maybe he'd just wait to know his kids when they were older. Smith would have none of it. According to McCall, Lewis has since made great efforts to spend time with his children (three live in Baltimore, three with McCall in Florida). He calls them daily, has movie dates with his two daughters on Fridays, sometimes brings all six kids to stay at his house on the weekends of home games. "That's the beauty: I give them what I never had," Lewis says. But he's only half right. Like his dad, he doesn't live with their mothers, doesn't see his children every night. His world has always been one of extremes—quotes, emotions, troubles, triumphs—and people's reactions follow suit. Lewis's history and his raw views, about "devious women" or how a black man in America is "still a n----- in a lot of peoples' eyes," will only reinforce the perception of those who call him a thug. But plenty of people also sit on the other end of the spectrum, ready, like Singletary, to put their names on the line and speak about "the pureness of his heart." 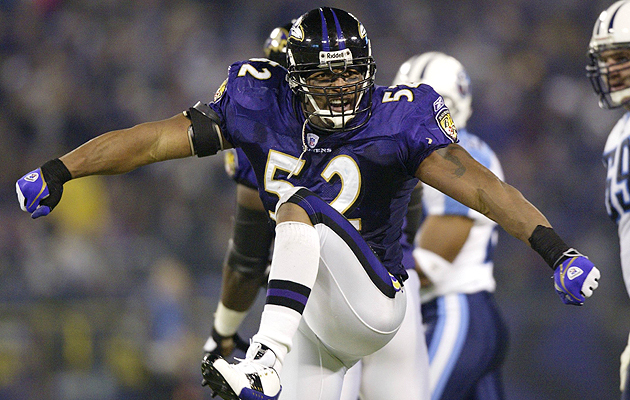 When Singletary took over as Ravens linebackers coach in 2003, Lewis was playing at a level few had ever seen, with a young man's fire, a veteran's knowledge and a once-in-a-generation hunger. But the first time they spoke, Lewis begged for instruction—and not only in football. They set up regular meetings, and the two went heart-to-heart for the next two years, discussing faith, family, "disciplines and desires and what a man is supposed to be," Lewis says. Whatever Singletary said, Lewis soaked up; once he suggested Lewis play more on the balls of his feet, and in the next practice Lewis collapsed because his calves were cramping. He'd been trying to play on tiptoes. After the 2004 season Singletary left for San Francisco, and Lewis got that feeling again: what he needed, walking out the door. But Lewis was also pushing 30, and maybe some lessons had sunk in. Bryant, his pastor, sensed Lewis learning something new and necessary: "If I'm a king, I am responsible to the kingdom I've created around me," Bryant says. "He has found that he had to father himself." Last spring, after a long silence, Lewis says he heard from Ray Jackson again. His father called from Tampa to say he'd been put out by a girlfriend and hospitalized. Against his better judgment Lewis rushed from his home in Boca Raton, intent on moving his father in at last. He sent a car to pick up Jackson; they were to meet at Lewis's grandmother's house in Lakeland. But when Lewis arrived, Jackson wasn't there. He stewed for a few hours, then got a call: His father wasn't coming. On the long ride home, Lewis tried to grab hold of himself and say, Toughen up! But it was no use. He cried the whole way, shaking, empty again, with familiar words rolling through his head: That's the last straw. I'm done. Lord knows, it hasn't been an easy path. But who said it should be? Lewis studies the story of David, who slew Goliath and became a king and had woman trouble too. He studies Job and all the trials God put him through. What was 2000, after all, but the work of the same master hand? From jail to a Super Bowl stage, with millions watching so he could become more famous, wield a greater voice than ever? Ray Lewis knows people will respond to him; he'll show you, with just a flick of his hands, how he can get 70,000 strangers to scream for him. So now, Lewis can feel it happening all over again. People had written him off after last year, marked him down as fading. Lewis was furious at the criticism. Billick and Newsome characterize Lewis's off-season sniping as a continuation of contract haggles from a year earlier; before the 2005 season he had sought to renegotiate his seven-year, $50 million contract, signed in 2002. People were calling for Lewis to be traded after he demanded the team beef up its defensive line, called him a malcontent for questioning the team's commitment. "Persecutions" is the word Lewis uses to describe the affair, at once paranoid and proselytyzing: They're out to get him, and it's part of God's plan. Yet the next thing you know Baltimore spent its first-round draft pick on defensive tackle Haloti Ngata. Then Lewis became the central factor in bringing McNair to the Ravens. Give me the pieces, Lewis told team owner Steve Bisciotti last February. Give me a real chance at another Super Bowl, or let me go. "What do y'all want me to do, seriously?" Lewis says of his critics. "The thing you've praised me for—being a courageous leader—is the same thing y'all trying to crucify me for now. I'm doing what you want, to say, 'Dammit, I'm not going to put up with this!' and suddenly [the team] said, 'Ray wanted to talk about money.' I never played this game for money, but now I do?" Yes, there's that word again: crucify. It's no slip. Lewis won't go so far as to call himself the Second Coming, but he's close to believing himself a prophet of sorts, and if martyrdom is the price, so be it. "God has me to do what people are afraid to do: tell the truth," he says. "Yes, racism does exist. Hatred exists every day. I'm not afraid. The worst thing that could happen to me—and I don't see it as the worst—is to be killed and go to heaven." Five weeks later in Baltimore, it's different. 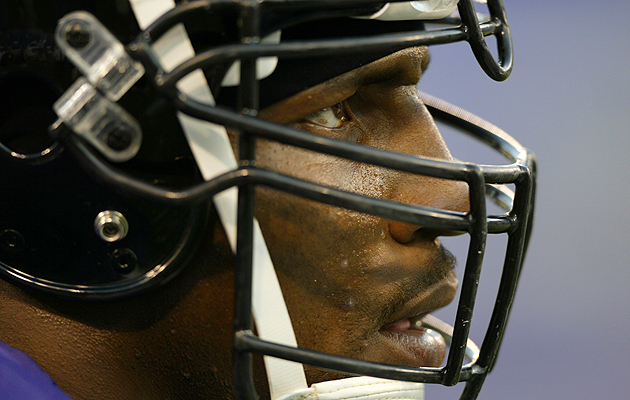 The Ravens have lost a seesaw spectacle with Carolina that left McNair with a concussion. The plan looks shaky for the moment; McNair has struggled, the running game is a mess. Still, Lewis led the defense in tackles again, and now he's in his family suite high above the empty stands. His kids are there, four boys and two girls squirming about his legs. "Let me see your abs!" Lewis commands two of the boys. They lift their jerseys, and he laughs and says, "You got to do your push-ups and sit-ups." The kids spill into the hall, Lewis bellowing, "Who knows my birthday?" "May 25th ... no, 15th," says one. "1975!" blurts another. "Grab your brothers' and sisters' hands now." The group stops at the elevator, Lewis's mother and sisters and friends bringing up the rear. A Baltimore police officer sidles up; a few hundred fans line the barriers outside, waiting. "Do you want us to walk you out there?" the cop asks Lewis. He thinks, then says, "No, there'll be lots of people." On the ground floor Lewis stands inside the main doors of the stadium, gathering the kids around him again. The crowd outside sees him through the glass, and you can hear his name in imploring tones, over and over, the pleas already starting for a signature, a photo. "Come on," he says and pushes; the doors fly open. His head is down. Sinner hits the late afternoon air, plunging forward to greet his flock.